Shop ‘n Save Shoppers here’s something you won’t want to miss! 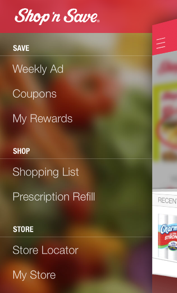 Shop ‘n Save has started a new rewards program. You can either sign up on the Shop ‘n Save website by creating an account, clicking my tools and then entering a rewards number..
Or you can download the new Shop ‘n Save Mobile App. Once you download the App you will be see My Rewards at the bottom of the screen. You will need to set up your rewards number (they suggest using your telephone number), then you can automatically add coupons to your rewards. If you forget your phone no problem – they can look up your number and enter the coupons at checkout! You’ll also have access to the weekly advertisement, you can make a shopping list and much more! If you choose not to download the App you can add coupons to your rewards account by clicking on the coupons you want to use from their website. I am SO excited about the new Rewards program! This is a big step for those of us in the St. Louis area!! For this weeks Shop ‘n Save bargains visit the Shop ‘n Save deals page.